Smiling compassionately at all that ever was! RADIANT REFLECTIONS is a collection consisting of light infused cosmic paintings and mystic poetry from the past 30 years of work of visionary artist and spiritual student Denise Sulaiha Sati. It's an opening to her inner garden of wonder. Denise infuses the light of her vision into the paintings and words of the book, and in her writing she shares why: "Light is the universal expression of that exquisite energy our sense can fully grasp and experience. The aesthetic use of light expresses the human longing. Light has eternally portrayed a cosmic consciousness, a transcendent divine reality." Denise longed to transcend art even while giving birth to these paintings from a meditative state, which proclaim an emphatic feminine force, subtle and serene, strong and visionary. The art works featured in the Radiant Reflections were created from an enhanced octave of the color spectrum. In the Preface of the book, the author writes, "The ancient Sufi expression, "Being in the world, but not of it", reminds us that we are connected to a Supreme, Creative, Intelligent, Source of Light ... As co-creators we align our power with that Divine Power. This then, is the Remembrance of our true self. Openly, freely meant for everyone, everywhere. This poetry and art originate from a direct inner spark and consciousness that transcend the outer world .. A cosmic celebration of transcendent possibilities." Where the Fair Witness resides. Denise Sati who is versatile in French language and a teacher of the same, wrote these poetry originally in French in 1977 while living in Boston, then translated herself in English and compiled with a collection of original paintings done throughout several decades. In an interview with Inspirations and Creative Thoughts, Denise shared about the work in Radiant Reflections: "Each painting was created as a prayer, as a vision of a meditative state of consciousness. The paintings and the poetry were created from the state of the Witness, rather than the individualized state. The transpersonal, rather than the personal state of consciousness. It was also created using the ancient, perennial, and contemporary philosophies of color healing. Each color, subtly infused with light, reflects a peaceful, harmonious, color healing energy. The images also reflect a strong, centering point within each painting, showing the universality of the center, inner point within all life. The poetry describes the states of consciousness of the journey taken from form to formlessness, from philosophy to experience, from witnessing to Being through the practice and process of the silent zikr meditation. All this, as radiant reflections of that One Radiant Eternal Light. The final poem in the book was written in one day. It is a very positive future vision of the qualitative, cosmic, mystical state of consciousness and reality possible for all of humanity. It is a very positive, peaceful, powerful, beautiful vision of what Life could be." Is the equation of perfection. In order to give birth to her visionary art Denise infuses painting with photography, mandala symbols and other collage elements that as a whole brings out a micro-cosmic slice of her inner macro-cosmos. Often the dazzling colors captures the mind immediately and then slowly the careful patterns and finer and even more finer details unveil themselves as one keep gazing at her art work. Her paintings demands both vertical and horizontal appreciation as the art work unfolds its beauty both instantly and gradually. This is equally true for her poems. They are not just poetic arrangements of words but also encoded message of highly sophisticated teaching of truth, method of seeking. Even though Radiation Reflections on the outset may appear to use new age language but the wisdom and consciousness that’s revealed through the poetic expressions of Denise and her collages are eternal. The words woven are very much a bridge of timeless spiritual wisdom and spiritual mind of new age which our present age we live in where wisdom from countless ancient paths are merging together in an unprecedented way. Radiant Reflection deserves credit to transcend the limitation of language when it comes to share timeless spirituality. There is no denying that Denise Sati received her spiritual nourishment from a sufi master of extra ordinary perception and wisdom. Thus in her expression one can discover her genius of expressing sufi teachings using modern discourse. In the poems, Intimate Journey, Denise Sati reveals the sufi wisdom of surrender and dropping of self-direction. Now the true inner journey has just begun. True inner state of each being. Denise is not only a student of sufi path but who has touched upon the depth wisdom of meditation. She studied and practiced meditation for a significant part of her life. Her own experience rising from the direct experience of meditation practice is reflected in her poem. Realization of the Inner Body is a guided map for mediation. In it she describes the inner work of meditation, "As one focuses on the soundless sound, Traces of external sounds will be erased and subside. Inner hearing will experience the vibration of Meditative Resonance. As one focuses on the inner radiance of the Eye of Wisdom, External and mental visions will disappear, Inner Sight will appear. As one focuses on the subtle breath, the External sense of smell will disappear, replaced by the Fragrance of purity, rose, love, Fragrances of awe. As one focuses on the inner Awareness, Physical sensations or touch will disappear, as Inner Awareness of the Current of the Zikr is now Awakened, felt and experienced within. As one focuses and rides on the breath with consciousness, External senses of taste will subside and Formless tastes will be quenched by the Refreshing, radiant Subtle spring of Divine Fulfillment." The Breathless State, for example, is not to be read just as a poem but it's a guide of esoteric practice of how the Breathless state is to be experienced. I quote partially here, "The Breathless State elevates consciousness upward. Floating in this vibrational field, awareness of the outer body Naturally fades. In this breathless state, the breath is experienced as an incredibly Fine, precise, subtle, silken thread, flowing seamlessly throughout the Fabric of the inner Light body, Enlightening the pathway within as it flows, awakening the tissues of Consciousness and Light. Upon the breath, Consciousness experiences the death of the outer Form and rebirth of the inner Body of Light..."
Similar is the poem Focus that talks about the alchemy of meditation. "Cultivate this. Each time more one-pointed, more precise. Focus upon the inner sense of knowing. Cultivate consciousness silently within the breath. There is nothing other than the Divine, Other than the Divine there is nothing. Everything is Consciousness and Grace. Focus this with the left and right breath. Cultivate the state of consciousness that is aware of this.. The left breath pulls away our former self. The right breath invites, attracts towards the Divine current to enlighten the thousands of breaths per day." Nothing is every the same. Light of the Eternal Calm. In the art of Denise, she uses Eidetic vision to create images and arts. When asked to elaborate on her visionary art which she calls Eidetic Images Dense shared: "An eidetic image is one which is pre-wired into our consciousness. It is an image which transcends time, form, culture and symbolizes a deep inner truth encoded within our DNA as divinely created humans. It reveals a hidden truth of the mystery of life. It is a message to inspire the discovery of our birthright to know Truth, Love, and Light within ourselves. It is a mirror in our heart which reflects the transpersonal aspect of cosmos. For example, in one of Bawa's mystical visions, he describes the archetypal tree of life. I was asked to do the cover painting for one of his books, entitled, To Die before Death, the Sufi Way of Life. From the image that I received from within, upon reading his vision, I was able to paint this celestial tree of souls for the book cover." Eidetic Imagery is difficult to define and the phenomenon has baffled psychologists and scientists alike for decades. Although this is a relative new field of understanding as we unveil more and more the complex nature of human mind, the sufis have long used terms such as Eyes of the Inner Heart or Vision of the Heart and Eidetic Imagery uses this inner faculty. The physical aspect of Eidetic Vision and Mental function of this phenomena has been noted and studied for well over a century. Famous artist, painter and mystic Leonardo Da Vinci was fascinated by this phenomena so much that he coined the term "Eidetic Vision" and one of his personal friend discovered techniques to develop the skill of Unconscious or Subconscious Seeing. Visionary artist Denise Sati was born Denise Ann Cortese in Niagara Falls, New York. The majestic presence of the Falls, a true natural wonder of power, her early artistic visions. Metaphysics, psychology and wisdom were always her special interests. Presently she resides in Wynnewood, Pennsylvania where she paints and teaches private creativity classes, and teachers French and Art. Her paintings depict spiritual, introspective images which she achieves with the airbrush for special effects. Having studied color theory in depth, both from ancient and contemporary research, she became involved in color healing and art therapy in conjunction with her paintings. In 1981 she lived in Sri Lanka for several months, studying meditation and wisdom with a beautiful Sufi master, and later, a month in India where further insights into spiritual reality were experienced. Hand Signed prints of the original paintings, fractal / graphic art and hand signed book orders are available at: Sulaiha.Sati@Gmail.com / Her web location is Sati Studio Arts. 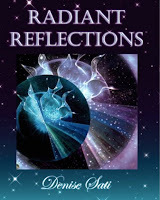 Also order for Radiant Reflections can be made through Xlibris and Amazon. (c) Images used, copyright Artist and Author Denise Sati, all of them except one are taken from Radiant Reflections.